This week I am sharing a bit about my early start as a writer and then I read an excerpt from my VERY FIRST book, My Cup of Tea: Musings of a Catholic Mom. 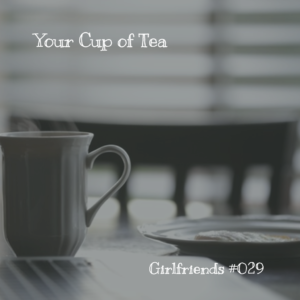 I invite you to share about what is “your cup of tea.” What kinds of sacrifices do you find challenging as a wife or mom, and how to do you put them into perspective? This week I share a great and funny conversation I had with Anna Mitchell from the Son Rise Morning Show. Usually, Anna is the one interviewing ME on Tuesday mornings on her show, but this time we turned the microphones around and she shared some of her personal and professional triumphs and goals. Very fun and inspiring too! As always, I am so grateful for your presence here. God bless your week! Loved hearing Chapter 1 of your first book! I am a newly married 24 year old. I loved listening and thinking about how life will change when we bring in little ones. I think my cup of tea is my marriage. It has been a month of transition and small challenges but we chose this vocation and are working onwards. Thanks Danielle! Congratulations, Cendy! May God bless you and your husband with many years of a happy marriage.